Home › dpf-diesel-particulate-filter › Which cars have the most DPF problems? For about a year Hypermiler.co.uk has seen as much traffic looking for advice on DPF filters as we have for fuel saving tips. These troublesome filters have seen many loyal diesel owners switching to petrol powered cars after some shockingly hefty bills. The most common question we seem to be asked is which modern diesel cars are most susceptible to DPF blockages and failures. Unfortunately for us, there’s no clear cut answer but see below a list of cars have most commonly popped up in both comments on our website and via our twitter account. With DPF filters not covered by warranty and with no way of instantly telling a car DPF history so very much buyer beware. If you are concerned about this it might be worth discussing with your sales man to see if you can have the DPF specifically covered for a short period after you collect your new vehicle. The biggest piece of advice we can give is that you need to choose carefully when choosing a new car. The headline MPG figures and cheap tax can make a very convincing argument in their own right. Do your homework and make sure a diesel car is the right for you. Also remember to check out our DPF cleaning page and DPF FAQ page it might help save you a fortune in repairs and DPF regenerations. It’s also worth having your EGR valve checked. Faulty or failed units can cause excess diesel particulates to be produced, thus causing the DPF filter to block quicker. This seems to effect older cars much more due to residue and carbon build up around the valve an EGR housing. 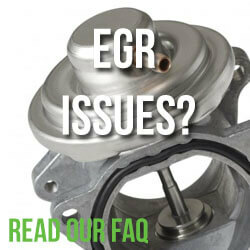 Make sure you check out our EGR valve FAQ page for more information. With the government’s recent U Turn over diesel cars in the centre of London the heyday of diesel cars could soon be at an end. Unless manufacturers have a trick up their sleeves we suspect that diesel cars will soon loose the financial benefits for both road tax and other emission based penalties. Older cars without DPF filters? If the horror stories aren’t enough to scare you away from diesel car ownership then why not choose an older oil burner that isn’t fitted with a DPF. Exhaust emissions standards for cars effectively required fitment of a DPF in the exhaust of diesel cars in 2009 when the ‘Euro 5’ standard came into force. Many cars before this time already had one fitted in anticipation of this requirement so it’s well worth doing your homework and check before you sign on the dotted line. 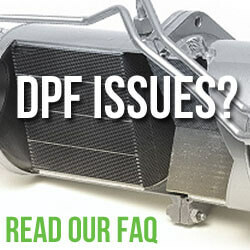 We’re currently putting together FAQ on make and model specific DPF regeneration. See below for our current articles to help you with your DPF regeneration. If you would like to contribute to the greater good then please get in touch. We’d love to hear from you if you’ve had both good and bad experiences with diesel particulate filters so please leave a comment below or get in touch using our contact form. ** 2016 Update ** – its great to see all the comments flooding in. We’re trying to update the page with as much information as possible and also start adding more vehicle specific DPF information. If you think you can contribute to this in any way then then please get in touch. When searching for a replacement for my 2006 Honda Accord Tourer CDTi diesel I wanted to make sure it’s replacement was also DFP’less. After much searching and with a need to pull a reasonably heavy caravan I opted for a 2007 Honda CRV CDTi diesel – again without a DPF. I used to do around 25K-35K miles a year so a diesel was justified. However, in the last year my annual mileage had dropped to around 10K. If I could have found an economical petrol with enough torque for pulling a caravan that would have been my preference – but nothing suitable that I could find in my budget. Hence picking the CRV diesel. in Australia under the emissions act it is legal to have the dfp filter in the exhaust removed and by passed which can be done by independants or a dealer but it costs around $2000 to have it done . it is able to be done under the reason of due cause re the effect and trouble caused to the motor by it. I have a diesel with a dpf, and so does the wife. No problems with either car, one at 130,000 miles and the other at 85000. 100% agree. I had Toyota Avensis T180 07. Sad thing is the engine is an absolute beast and car is nice to drive from the Mickey Mouse DPF system. Every day, 10 – 15 minutes in the journey the car would do one of the smokiest regenerations ever, particularlr from Autumn till late spring. Pile of Bilge!! Had engine replaced under guarantee and 2 turbos, got rid and now in petrol car!! so please can you tell me what is good to get , diesel or patrol ?? Petrol. Don’t even think about any Diesel for your motoring needs. I have an S Cross Diesel and in two years it has given me zero trouble, not even a warning light, but I have driven it regularly on routine shortish journeys, but often longer ones too, and always without much crawling in town. I have driven the new Vitara petrol automatic 1.6 and it was very good, but I’m buying the 1.4 petrol turbo, because I loved the performance. Get the petrol car, it’s a no brainier in your circumstances. Diesel is 5hite, any money you save on fuel will bne more than swallowed up by repairs to the diesel system, GO FOR PETROL DIESEL IS DEAD!! I used to drive an Opel (Vauxhall) Corsa 1.7d, old and reliable. When it came the time to change it (and I still miss it) I searched for a used Diesel car without DPF. The choice was a Jaguar X-Type Diesel (hell of a change, I know!) 🙂 and one of the main reasons to buy it (besides de fact that I love british cars – yes, I know, an X-Type is not a british car to some of you…) was the absence of DPF. I predict that if the technology remains the same in advancement and price, the used Diesel market will meet it’s end soon. I am considering purchasing the new Mercedes GLC but they only do a diesel version and have no intention of doing a petrol version at any time soon . I only do short journeys of 8 or so miles thwomor three times a week and the occasional longer trips of 20 miles and very occasionally 100 miles plus . Am I going to have DPF problems all the time , the reason for the choice is that it affords my wife easier access as she is semi disabled . I first bought a diesel in 2011 , a Ford S. Max titanium X sport with Powershift gear box. In 3 years and 57000 miles there was never a DPF problem. It was replaced in 2014 with a VW CC GT , 20,000 miles so far and no problems yet fantastic mpg . On a 600 miles round trip yesterday my average was 62. Dirty diesel ? Maybe but that mpg with 200 ps! You won’t get any DPF issues under 60k, it’s past that and in the second hand car market it causes an issue. If you have a new car every 3 years you won’t have to care about having a DPF. If you are buying second hand with over 60k miles factor in paying out another £1300 for a DPF filter and all the other issues that will arise with an aging diesel. ( Clutch, DMF, EGR, Injectors, Fuel pump) Diesel is an oily fuel and clogs up various parts of the system over time. I bought a Mazda 6, 2007, 2 Litre and the it had huge problems because of the DPF. Mazda is known to have these problems, but I didn’t know about it at the time. I’m not sure what happens with other cars, but with my Mazda when the DPF light started flashing the engine also lost it’s power. It goes into a sort of standby mode where no matter how much you you put your foot down on the accelerator it will not pick up speed at all and the engine just sounded like it was being pushed. The second problem is that one of the ways to deal with this “APPARENTLY” is to put in a diesel cleaner and thrash it on the motorway for all the crap to be filter out. Imagine doing this every time how much you’de be buying the cleaner which averages around £15 and the pointless driving. A mechanic also advised me that cars with DPF should only be bought if yu use your car for long distances and NEVER short runs like dropping kids to school, then shopping trips etc because the stop start and constant revving causes huge problems. Anyway i’m not a mechanic, but I’ll never buy a diesel again. back to petrol for me because I’ve got short lots of trips. Currently 2 years in to the ownership of my first diesel car and I won’t have another one !!! The car is a BMW 3 series diesel 2.0T with a dpf of course… Every couple of weeks the light comes on for it and I have to drive at 3-4K revs for 20 minutes straight to get it off, car is mostly used on motorways and still clogging up but the economy is good so can’t complain, when I do have to drive around town though my fuel economy is probably worse than a Aston Martin so if you mostly do town I’d go for a petrol because diesel is poor economy in town (no matter what the manufacturer says) and you will be plagued by the dpf! I have a 2007 focus 1.6 Dti, 97,000 miles. The engine warning light came on about a year ago and I was told by the garage not to worry. Last sept I was away for 3 weeks so did not drive my car and when I erturned I noticed the fuel consumption had dropped by 10mpg. I drive 38 miles 5 days a week to wk and back. Eventually I took it to a ford garage and they charged me £250 to fill some small tank with an additive??? They said my DPF would regenerate and the MPH would go back up, this was about 3 months ago and the light is out but the MPG as got lower, so now averages around 38MPG when it used to be 52 mpg. I would like some advice on what I should do now to try and get this rectified? How can I be certain that if I am told I need to buy a new DPF that I am been told the truth, as I believe this can be at least £1000? If this is the case should I just sell the car? I have a 58 reg Mazda 6 2.0 diesel and have had continued dpf warning lights. First garage I took it to reset the light as they claimed it was used as a service indicator light to drum up trade for main dealers. This caused me to sheer off the turbo while overtaking and a £900 bill. Dpf light comes on every 12 months or so costing £300 for a garage to force a regen cycle. I don’t want another diesel because of this but I need a big car due to work equipment and mileage, petrol large cars are almost non existent on the 2nd hand market. I have had my Vauxhall Antara 4X4 2.2 diesel for nearly 3 years now and the dpf does a regen every 500 – 520 miles. Trouble is the fuel consumption goes down to approximately 15 mpg, I normally get about 26mpg around the doors. Wont have another Vauxhall diesel but I am considering a SEAT. I have been told the add blue is a much better system. DPFs are a pile of 8hite!! i have a chevrolet cruze 2.0 vcdi 62 reg i have owned it for just 3 years and have noticed that the dpf light comes on about every 5 weeks i have a journey to work and back 4 nights a week of about 10 miles each way ,so roughly 80 miles a week ,i now have to do a monthly journey up and down the m55 aprox 40 mile round trip to clear my dpf even though i like this car as its quick and very good on fuel return i find myself thinking of getting rid and buying a petrol car . I have a Toyota Urban Cruiser Deisel and it is quite frankly dangerous. The engine cuts out at high speed with no warning light. I have had some very close calls. I have been in dispute with Toyota as they failed to fix the car repeatedly. I have tried to get them to refund my money but they insist the problem is occurring because I do too many stop start journeys. Well if the car in front stops I have to stop so a car that breaks down if you do this is not fit for purpose in my book. I have been paying payments on my finance even though the car has not been roadworthy for 7 months. My only option now is to give the car back and warn everyone I know about buying a Deisel car from Toyota. Worst car I have ever had. Worst company I have ever dealt with. My 2013 Audi A6 has just had the DPF replaced at 63000 miles along with a couple of sensors. Just out of warranty. Total bill just under £2500. Audi and the Audi dealer that has serviced this and my previous Audi made a combined 50% goodwill contribution. Still this is an expensive lesson. I wasn’t expecting problems as I do lots of miles, about half of which are long motorway trips. The 1st sign of problems was after a week that involved over 400 miles of motorway trips. I think part of the problem is that at 80mph the engine is doing less than 2000rpm. If the DPF needs cleaning the automatic gearbox should be capable of selecting the correct gear by itself along with a dashboard message explaining why it is revving higher than normal. use manual change. 4th gear should give about 3000 on the motorways. Economy should be about the same. Similar to my insignia. tip. Remove the oxygen sensor and pour any PDF cleaner straight into the exhaust. Leave overnight. takes about 10 minutes to remove and 10 minutes to replace. regards. I bought a Mercedes Benz A 200 d AMG line year 65 from MERC dealership.I don’t do a lot of mileage is it a bad buy.I wanted to change it for a petrol engine so far no response from the dealership. I had a Honda civic coupe (petrol) for 8 yrs..loved it and it never let me down.Upgraded and put all my 8yrs of saving into a Honda CRV dtec diesel 2011, 2 yrs ago and had nothing but trouble with dpf.Just been told it now needs replacing at cost of £4k!! which I don’t have.pre-warning light about 6 times this year (about 2hrs driving about each time to get it to go off..so much for economy) & 2xregens. Followed all advice in the manual to the letter.I did take out extra warranty 6months ago at Hondas advice and have to wait for an answer next week to see if covers replacement dpf. After me raving about how great Honda cars and service is when I had my civic, feel proper let down & having to rely on taxis in the meantime. So right now i am taking a 2hr,30m bus trip to claim my car. First time was a 4,30 hr trip and whend let me down was way far from city, full of luggage, 2 small kids and m wife, so imagine the “fun” on the side of the road. I have a continual problem with the DPF on an Honda CRV on 2010 plate. I do short and long journeys but get the problem every few months even though I drive on motorways at a high speed every other week. 1 Pings/Trackbacks for "Which cars have the most DPF problems?"